Ultrasonics Sonochemistry is a leading international journal devoted to publishing excellent quality research articles primarily on chemical reactions and reactors induced by ultrasonic waves, namely sonochemistry. In addition to focusing on chemical reactions, Ultrasonics Sonochemistry also values contributions related to cavitation (acoustic or hydrodynamic) induced events and processing such as sonoluminescence, and chemical/physical/biological transformation of materials. 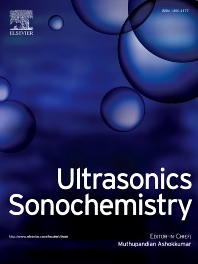 Ultrasonics Sonochemistry publishes excellent quality papers in a number of areas involving ultrasonics and sonochemistry. Since its establishment in 1994, the journal's ranking has been consistently high and currently the top ranked journal in the "Acoustics" category. Papers published in Ultrasonics Sonochemistry are highly relevant to academics and the industry sector. Ultrasonics Sonochemistry considers high quality manuscripts for publication under the following categories: Full length research articles, Reviews and Short Communications in the research topics/areas listed below. Manuscripts reporting routine/incremental work will not be considered for publication under any category / topic. Acoustic cavitation: Theory, bubble dynamics and fundamental work pertaining to: single and/or multiple bubbles dynamics in a fluctuating force field of pressure, light and magnetism; effect of physico-chemical properties of the gases/vapour components and also fluid properties such as surface tension, viscosity, rheology etc. ; basic force and energy balance equation and models for single and multibubble systems; various analytical and numerical solutions to the equations derived in various force fields under a variety of boundary and initial conditions; algorithms for the different solution schemes for single and multiple bubble dynamics and/or their interactions; establishing links between the fundamental dynamics with microscopic/macroscopic and bulk effects, including symmetric and asymmetric bubble oscillations; cavitational intensity; spatio-temporal distribution. Sonochemistry: Chemical and physical operating parameters influencing cavitation threshold, activity, intensity and associated effects (experimental and theoretical); chemical and physical dosimetry of cavitational activity; frequency effect on sonochemistry; single bubble sonochemistry; sonochemistry in non-cavitating conditions; reactor and probe design; scale-up. Sonoluminescence: Single bubble sonoluminescence (SBSL); multibubble sonoluminescence (MBSL); sonochemiluminescence (SCL); cavitation bubble structures; sonophoto-luminescence (SPL); sonoluminescence quenching; effect of frequency and acoustic power on sonoluminescence; characterisation of ultrasonic reactors using sonoluminescence and/or sonochemiluminescence. Synthesis of materials including inorganic and organic materials: Ultrasonic/ sonochemical/ultrasound-assisted synthesis of organic materials such as organic molecules, polymer materials, and supermolecular compounds; ultrasonic/sonochemical/ultrasound-assisted synthesis of inorganic materials, such as, inorganic molecules, metals, metal oxides, and ceramics and ceramic micromaterials/nanomaterials; Ultrasonic activation of synthetic reactions. Sonoprocessing: Ultrasonic-assisted extraction of oil, bioactive compounds, natural products, antioxidant compounds etc. ; Soil washing for removing soil contaminates with ultrasounds; ultrasonic/acoustic emulsification of two or more immiscible liquid phases; treatment of contaminated soil/surfaces. Food processing: Processing of food and/or dairy systems (e.g., dairy/whey proteins; starch, polyphenols, etc.) using ultrasound; ultrasonic modification of functional properties of food/dairy systems; ultrasonic activation/deactivation of enzymes in food/dairy systems; ultrasonic deactivation of pathogens in food/dairy systems; ultrasonic extraction of functional (e.g., polyphenols, antioxidants) ingredients; large scale reactors for food processing applications; ultrasonic preparation of food emulsions. Environmental remediation: Destruction/removal of pollutants or contaminants from soil, ground or water; influence of physical and chemical operating parameters on kinetics; elucidation of chemical pathways; Advanced Oxidation Processes (AOPs); sono-Fenton and related topics; sonocatalysis and related topics; scale-up processes. Sonocrystallisation: Work pertaining to: effect of acoustic irradiations and turbulent velocity and pressure fluctuations on the nucleation, growth and the particle size distribution (PSD); population balance models and probabilities of particle breakage and /or agglomeration and nucleation; system properties and the effect of the same on sonication, it's propagation and alteration and hence the crystallization phenomenon; energetic (energy balance) of crystallization and the role of acoustics on the same. Sonoelectrochemistry: Electrosynthesis of useful compounds and materials in an ultrasonic field; ultrasonic activation of electrochemical reactions; ultrasonic enhancement of detection sensitivity in electroanalysis. Detailed experimental procedure as well as mechanisms should be critically discussed. Manuscripts reporting such combined technologies without such details or constructive discussion will not be considered for publication. Hybrid techniques: Ultrasonic coupling with other technologies (other than sonoelectrochemistry), microwave, photochemistry (sonophotocatalysis), tribochemistry, mechano-chemistry, etc. ), dual and multifrequency operation at laboratory or large scale leading to enhanced efficiency. Detailed experimental procedure as well as mechanisms should be critically discussed. Manuscripts reporting such combined technologies without such details or constructive discussion will be not considered for publication. Ultrasound in biomedical applications: Ultrasonic synthesis of microspheres/nanospheres for drug/nutrient delivery; ultrasonic/sonochemical synthesis of protein microspheres and core-shell architectures; ultrasonic/sonochemical synthesis of biomaterials. Manuscripts dealing with therapeutic/diagnostic effects of ultrasound may notbe suitable for this journal. Hydrodynamic cavitation: Work pertaining to: cavitation in hydraulic and high fluid velocity rotary and linear velocity systems; fundamentals of cavity/bubble nucleation, growth and collapse (cavitation), under rotary machines and high speed constricted flows; experimental validation (cause and effects) of the cavitation phenomena and harnessing of the energy release; scale -up studies and industrial cavitating systems.